The sustainable builders at ArtisTree are known for creating some seriously beautiful and green structures. 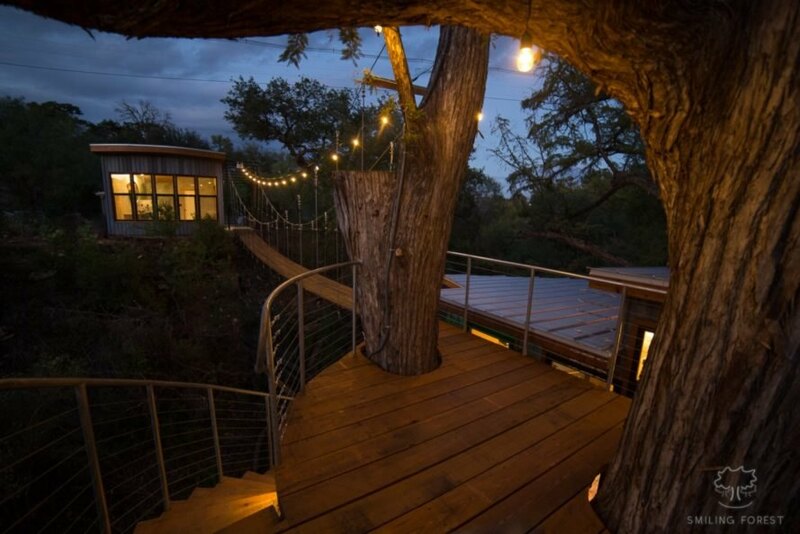 The company has just unveiled a charming treehouse located in a remote eco-retreat in Texas. 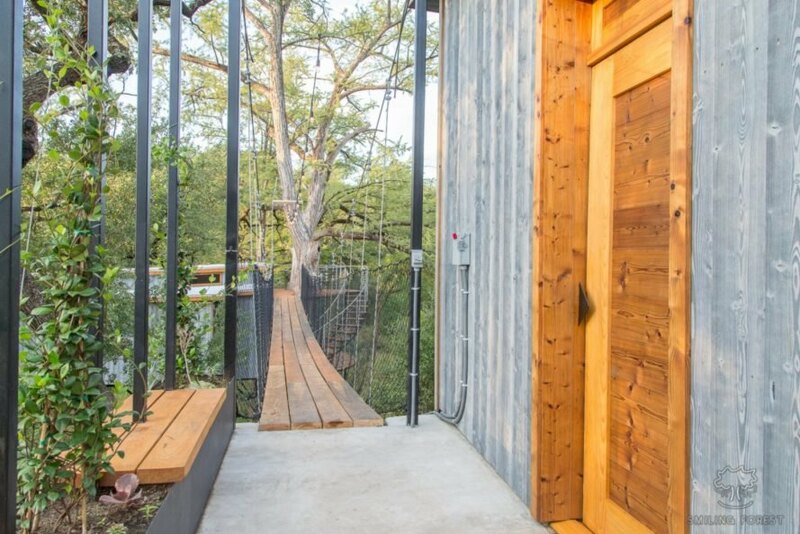 Perched 25 feet in the air between two cypress trees, the Yoki Treehouse is an exceptional example of the company’s artistry and deep respect for nature. 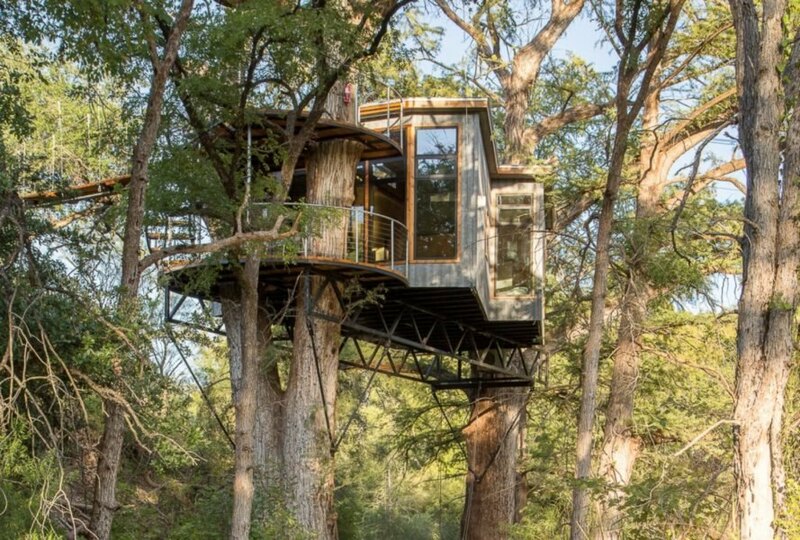 Built with sustainable woods such as elm, cypress and spruce, the treehouse holds court high up within the tree canopy. The retreat is comprised of a 500-square-foot suspended treehouse and a separate bathhouse, which sits on solid ground. The two buildings are connected by a 60-foot-long suspension bridge with various platforms to provide plenty of open spaces for enjoying the surrounding nature. In the main house, this strong emphasis on nature is apparent at every angle. The entrance is located on the roof, which doubles as an observation platform perfect for enjoying the lush green forest views and the babbling brook. There is also an open-air porch where the branches grow through the floor, further connecting the structure into its environment. Inside, the walls of the treehouse are clad in a warm birch wood, creating a cabin-like aesthetic. Again, an abundance of windows, including an all-glass front wall, allows guests to reconnect with nature. The interior design and furnishings were inspired by Japanese minimalism, while touches of Turkish decor add a sense of whimsy. The separate bathhouse was built with solitude in mind. It features a spa-like atmosphere, complete with a large Onsen-style soaking bathtub. Ample floor-to-ceiling windows offer guests a serene spot to enjoy a bit of bird watching or stargazing. Absolutely stunning! It looks so much smaller from outside than it actually is - there's plenty of room. I wish there will be more tree houses available in the future (and wifi to support those, usually, remote destinations). 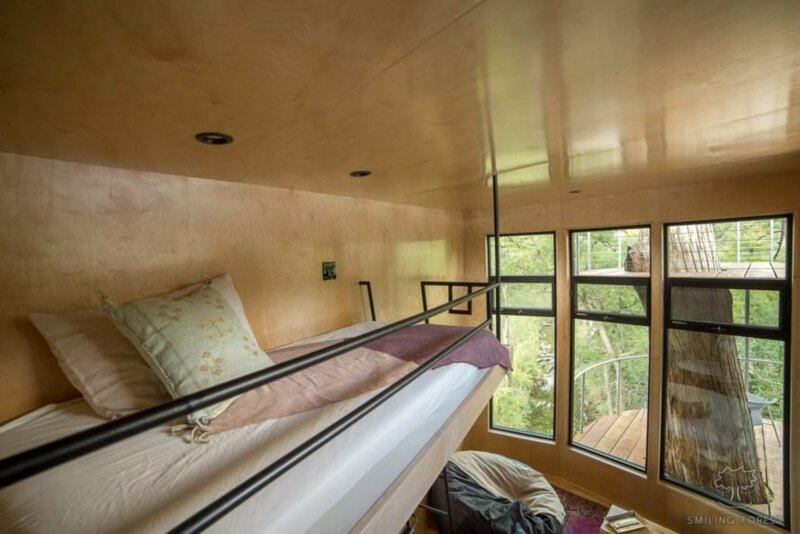 The Yoki Treehouse was built by the sustainable builders at ArtisTree. A dramatic suspension bridge leads to the entrance. 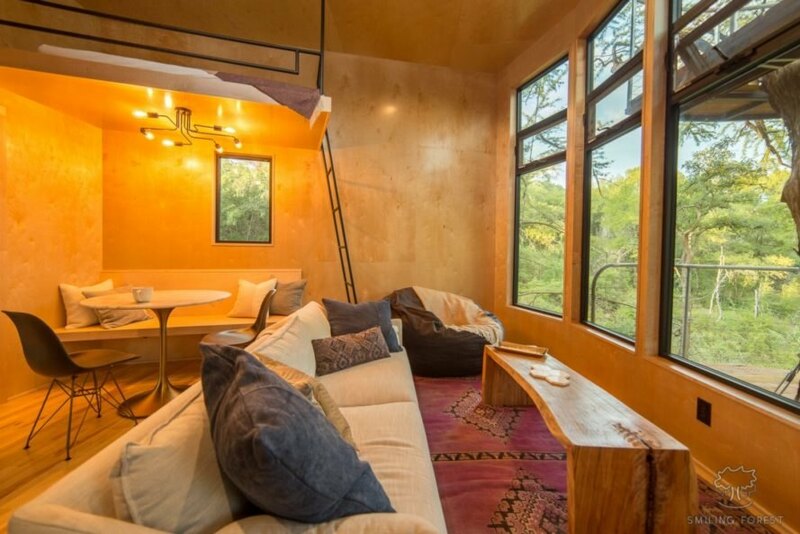 The treehouse was built with sustainable wood. The suspension bridge has a few nature-viewing platforms. 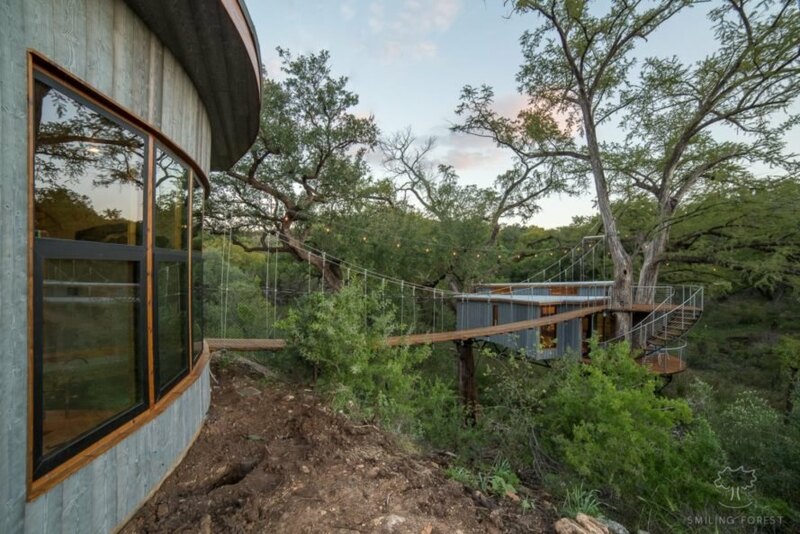 A long suspension bridge connects the treehouse with a bathhouse. There are plenty of outdoor spots to enjoy the scenery. 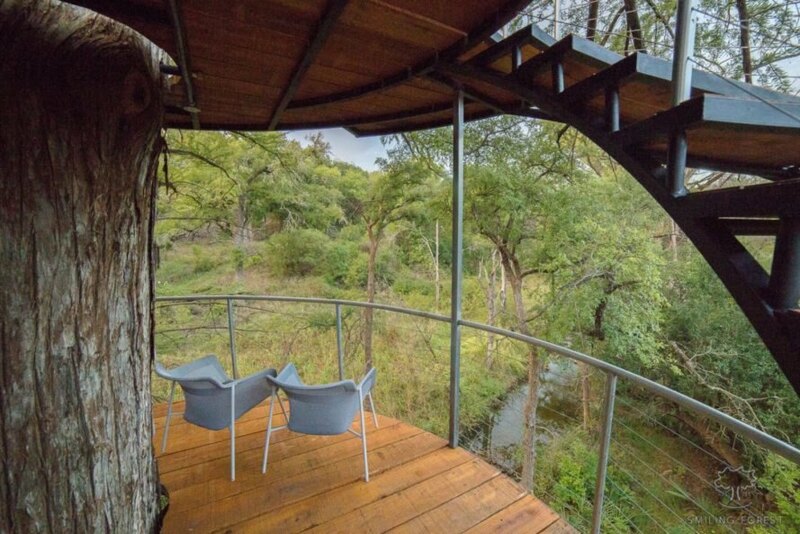 The treehouse offers many windows for viewing the surroundings. 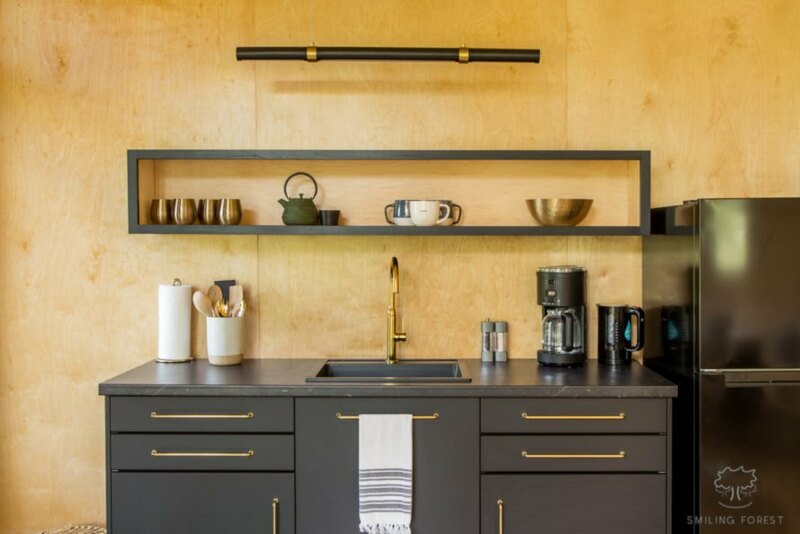 The kitchen is fully equipped for guests who love to cook. The interior design was inspired by Japanese minimalism. Luxurious yet minimalist decor fills the treehouse. A lofted bed offers room for an extra guest. This bed benefits from natural light. The bathroom has a spa-like atmosphere. 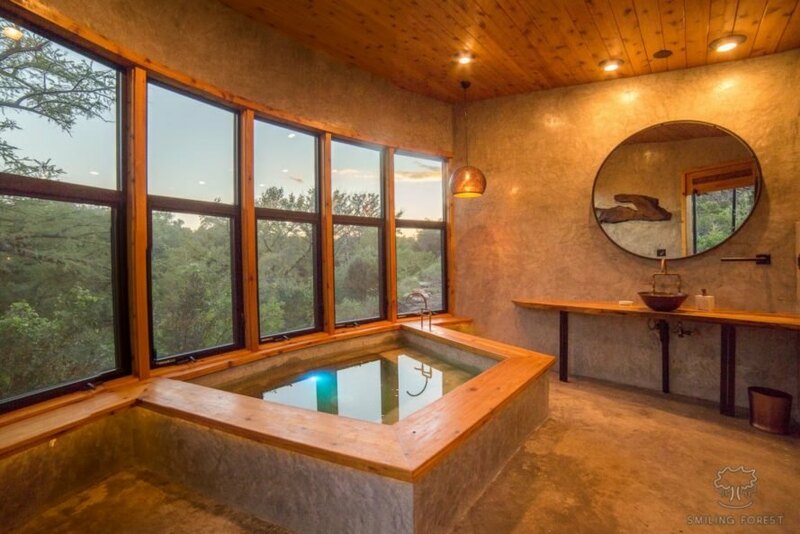 An Onsen-style soaking tub in the bathhouse is perfect for enjoying the vistas. 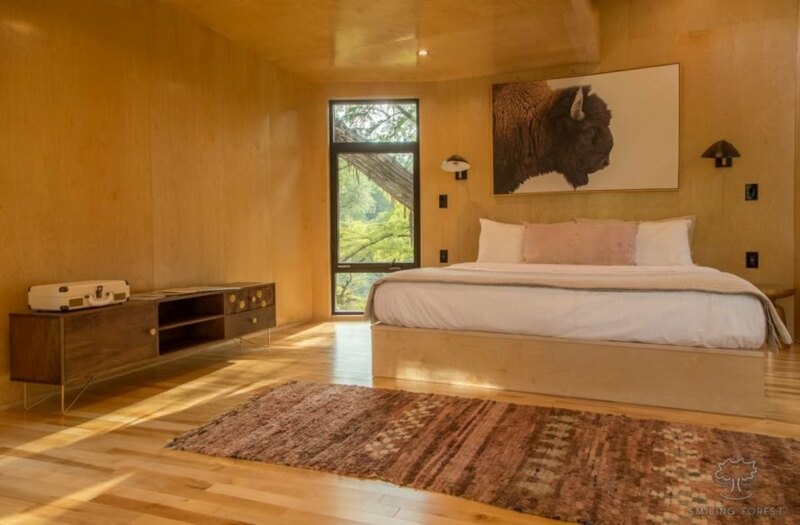 Wooden paneling lends a cabin feel. The suspension bridge emits a warm glow at night. Walking over the bridge inserts visitors into the environment.